Contrary to the maxim popularised by political scientists that there is no political community without a political identity, what Europe most needs is a political community without identity. A reply to Etienne Balibar. Let me begin with a personal anecdote that speaks to the political crisis Europe is facing today. Having recently become a Belgian citizen, I – along with 11 million other Belgians, have been overwhelmed by the lack of time to study and scrutinize the different European parties and platforms, one of whom I will have had to (voting is compulsory) select on Sunday, May 25. In Belgium, as in other European countries, several elections are running concurrently. While I understand the financial advantages of having as many elections as possible on one day, the price paid for such profit is democracy itself. Much like the unfolding of the European project, this is a case where economics trumps politics. When voters are not able to take the time to make a considered choice, possibly to get involved, hear a debate, ask questions etc., the absolute minimum requirement for any democracy – the vote itself - becomes futile. It should come as no surprise that so many people don’t even bother to vote. This is the first issue we, the people of Europe (regardless of our citizenship), must address: how can we make Europe more about politics than profit and in so doing return solidarity and prosperity to a continent divided by austerity? The second issue arose when I finally managed to make time to study the many European parties and platforms. Impressed with their ideas about Europe ‘to come’ as one that fights neoliberalism, austerity and poverty in order to create solidarity and prosperity, I had made up my mind to vote for the European Left party. I then proceeded to click on the map of Europe to discover what the party’s name was in Flanders, where I am to vote. What I rapidly discovered is that I cannot vote for the party that best expresses my idea of Europe. This is problem number two: how can we build a European demos when the system/structure prevents ideas from crossing borders? My choices are limited to the local parties that have aligned themselves with particular European parties. Thus not only do I have to accept that I cannot strongly identify with a local party, I must also accept that I will be unable to vote for my idea of Europe. Why can I not vote for parties in other countries, in other languages, with other leaders? Isn’t this precisely what we should be able to do if we are trying to create a European polis? From this angle it looks like Europe still has internally guarded borders; the guards being regional or national political parties. How are we to build a European demos, to create solidarity, if we cannot vote beyond our borders – both physically and mentally. In this vein, I strongly endorse the credo as expressed by Etienne Balibar: “I believe that what history shows is not that a demos preexists its own political mobilization (or, as I said in the classical language, “insurgency”): on the contrary, it is the ensemble of democratic movements within a social and political content, which really create or generate the demos”. The latter anecdotal evidence clears a path for my third, and central, concern with regard to Europe. What I believe we, the people of Europe, most need to understand is that our Europe ‘to come’ must begin by rejecting the idea that we need an idea of Europe. This was the inspiration for what eventually has become the EU as is evident from the flags outside the EU parliament in Brussels that tell the story of its creation. The first flag shows the gates of Auschwitz reminding us of Europe’s darkest moments and its slogan ‘Work Makes Free’. No matter how great the idea of Europe is or was, we must now begin to take responsibility for its reality. 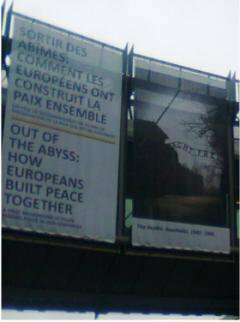 What writers like Arendt and Levinas tried to help us understand is that this slogan cannot be detached from a past idea, whether distorted or not, of Europe. What I would add is that this idea has once again reared its ugly face in Europe. How different is this Nazi slogan to the austerity message the Troika sent to the people of Greece and Spain during the economic crisis? How different are the mass unmarked graves scattered around Europe from those of Srebrenica or those of the 20,000 who died risking their lives to penetrate Fortress Europe? This is where we have come from and exactly where we should never again return. The project of the EU should be to create a space for the clash of ideas, a Europe of different visions, different voices, different languages that are continuously in discourse. We do not need a singular unitary idea of Europe. Such singularity has all too often ended in violent and exclusionary identity-constructions. What we need is a space for plurality - a Europe of Ideas. Contrary to the maxim popularised by political scientists that there is no political community without a political identity, what Europe most needs is a political community without identity. It is time to question the assumption that a Europe ‘to come’ needs an identity or a new idea of Europe. Many of those critical of the EU claim there is no European identity and thus there can be no European Union. Likewise, many of those in favour of the EU continue to debate what this identity ought to be. Perhaps rather than creating another potentially exclusionary identity we should act together to ensure that Europe’s future identity is opposed to the past idea of Europe. This possibility, explored in part by Roberto Esposito, calls for a community of responsibility; Europe ‘to come’ could be a community bound together by the privilege that Europe has had over others across the globe, rather than a union based on an exclusionary identity-construction. Let us reject the idea of Europe and embrace a Europe of ideas.